This event is open to all. Come join with us! "Flowers & Lace" Victorian Tea Party...Saturday, May 4th! Click on Calendar of Events for details! A tremendous amount of work has taken place this week! This room is what we call the Tavern Room. The picture on the left is looking from the front of the house toward the rear. The picture on the right is looking from the rear toward the front of the house. This week we were able to remove the steel support beams that ran from the front to the rear in this room that were put in incorrectly years ago. They blocked the renovation efforts around the windows and the walls. We replaced them with the support beam that runs across the middle of the ceiling which provides the needed support to the floors above as well as gives us access to properly and finally complete the windows and walls of the room. The steel beam above is being blocked in and will become part of the interior décor. A special big-time Thank You! goes out to Coram Fire District Commissioner Van Johnson and the members of the Coram Fire Department for volunteering to assist with this back-breaking effort! And thanks also to TOB Parks Commissioner Ed Morris for providing the necessary equipment to get this job done! This is the main Parlor Room. Note the steel beam that runs across the ceiling. It is a continuation of the support beam in the Tavern Room. Note how it is being boxed in. The picture on the left is a view of this room from the rear looking toward the front which faces Middle Country Road. The picture on the right is a view from the curio cabinet Looking eastward toward the front door. That is the parlor fireplace and the staircase (right behind the front door of the house) that leads to the second level. The Parlor and Tavern Room are part of the original section of the Davis House. The picture on the left is of the Old Kitchen which includes the bee-hive oven in the fireplace. The cabinet to the left of the fireplace is original to this room. The picture on the right is looking west to east toward the Old Kitchen and is the Rear Hallway of the house. 1. Spackling of the walls and ceilings throughout the house (where not being plastered) is close to complete. 2. Decision was reached to put the archive room on the first floor rather than the second floor as originally planned. This will now be in the easternmost room (clerk's office). We have created a closet off of this room behind the old kitchen fireplace. This will be for our file cabinets and secure storage. This room is almost done. 3. The old dining room is almost done; needs some paint. 4. We opened up the wall between the old dining room and the tavern room. It was framed for a 3' door and we made it a 5' opening. It shows this on the historic pictures that we have of the house. It also shows glass French doors in this opening. 5. We have also been working on the old kitchen. We have built a new mantle for the fireplace (old one was missing). We have put bead board in the room and stained it. We have also installed the old china cupboard next to the fireplace where it was originally (see picture above). 6. We are finishing the painting in the new kitchen. 7. The west parlor is spackled and the corner cupboard is in place. 8. The main entry staircase has been rebuilt and installed (see picture above). 9. The new office (northwesternmost room) is being spackled. 10. The hall is spackled and the fireplace mantle has been rebuilt. 11. Our Coram Fire Department is going to give us some volunteers and the Town of Brookhaven is providing the pneumatic lift to remove the steel beams in the tavern room. Once this is complete, we can install the proper I-beams and we can finally finish this room. The next General Business Meeting of the Davis Town Meeting House Society, Inc. is on Monday, April 1st at 7:00 PM at the Swezey-Avey House located at the intersection of Main Street and Yaphank Avenue in Yaphank. 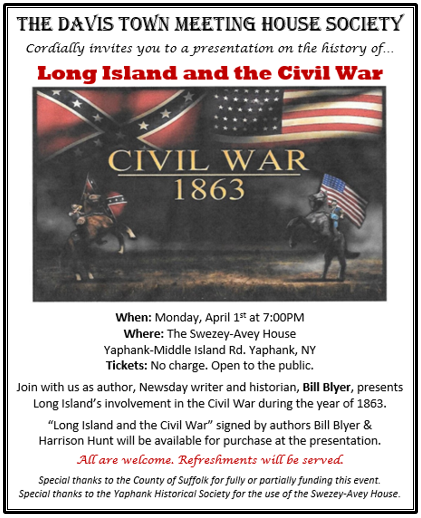 There will be a Special Presentation that evening on "Long Island and the Civil War" by Bill Blyer, author, Newsday writer and historian. All are welcome! Please check our Calendar of Events for our monthly meetings and presentations as well as our fundraising events such as our annual Victorian Tea Party in May and our Yard Sale & Craft Fair in September featuring historical reenactments by the 3rd NY Regiment LI Companies 1775! Most importantly, become part of our conservation of history projects by joining with us! Click on our Membership tab and help us preserve history! The historic and once proud Norton House, one of the last vestiges of Coram history, is currently close to being gone forever. Located on Middle Country Road, just west of McDonalds, it lies on private property, deteriorating rapidly, and approaching the point of no return. Your Davis Town Meeting House Society has approached Preservation Long Island in an effort to gain support for preserving this historic landmark. Preservation Long Island has visited the site and we have nominated the Norton House for inclusion on their Endangered Historic Places list for 2019. We are working actively hand-in-hand with the Town of Brookhaven and Suffolk County to hopefully save this piece of Coram history. To learn more about The Norton House and its history--and how you can help preserve this historic home--click on The Norton House tab. The Lester H. Davis House, circa 1750, is located at the junction of Middle Country Road and Coram-Mt. Sinai Road in the hamlet of Coram, New York. The color picture you see above in the masthead shows the completed exterior restoration efforts as of late 2012. The Lester H. Davis House (historically known as the Davis Town Meeting House) is owned by the Town of Brookhaven. Completion of the interior will be a multi-year effort due both to the extensive scope of work as well as to the financial restoration demands. The magnitude of the effort required to restore this wonderful historic landmark is immense. This will be the primary effort and goal of the Davis Town Meeting House Society, Inc. working hand-in-hand with the Town of Brookhaven Department of Parks & Recreation. For more information on the Society, click on About Us. For a peek at the plans of the basic interior design layout, click here. Membership in the Davis Town Meeting House Society is open to everyone. You will just need to have an interest in being part of the restoration of the historic Lester H. Davis House to its original splendor! All donations made to the Davis Town Meeting House Society, Inc. are eligible for tax deduction under our IRS 501(c)(3) status. Any errors of content are ours alone and we would appreciate your letting us know about them. We would also welcome any and all suggestions you may have for additional content. You can email us at:info@davistownmeetinghouse.orgor click onContact Us. Credit for much of the information contained within this site goes toLongwood's Journey.